Design and implementation of interactive magazine platform that doesn't require the use of flash. 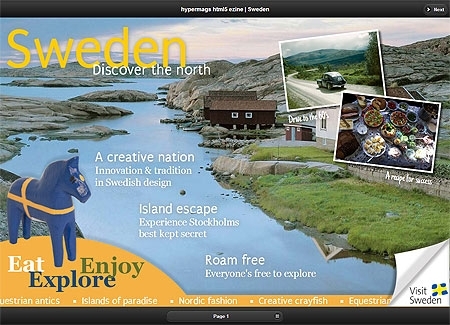 Featuring rich interactive content that works on PCs and tablet computers such as the ipad. The magazine can scaled to fill the available browser frame while maintaining its aspect ratio. Develop a fun game to encourage awareness of the National Skills for logistics organisation. The game is included within an ezine informing young people of logistics career opportunities within the museum sector. Development of a page turner catalogue with simple animation and deep links to the T M Lewin ecommerce site. Ongoing contract with Redwood publishing as Senior Flash developer, programming interactive content for Virgin medias customer ezine "electric!" Since issue 7, April 2009. 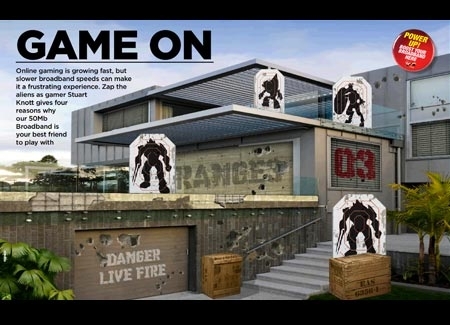 The ezine includes various games and features, these are programmed using flash actionscript. Tour de France cycling game for the Virgin media electric ezine. 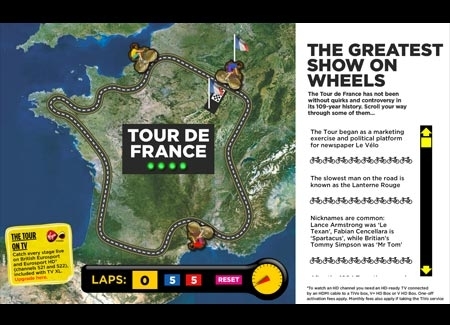 The game challenges the user to a race around the Tour De France circuit against three computer controlled opponents. 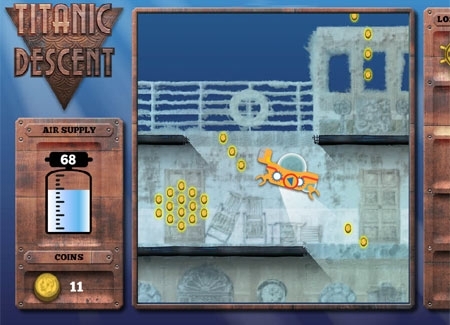 Simple controls allow the user to experience the immediate fun of the game. But if the user goes to fast they will come off the track. Game on feature/game for the virgin electric! eDition based ezine. The brief was to build a feature that would capture the imagination. A hybrid feature/game was produced. The user is encouraged to shoot at the aliens to produce interesting facts about gaming. Platform game to promote the idea of the use of games for marketing. 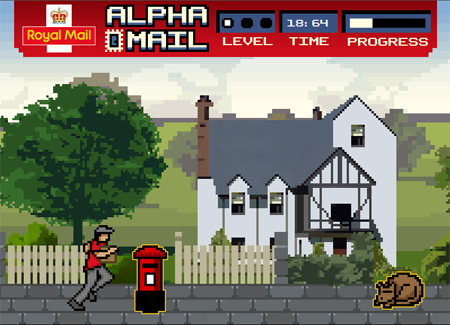 The game was publicised in the Royal Mails "Contact" magazine. The game features 3 levels of play and data capture is used to collect high scores and then display them on a league table. Grand National Racing Game for the Virgin media electric ezine. The game challenges the user to a retro key bashing style endurance race against the other riders. Realism is created by use of dynamic drop shadows and synchronized animation. 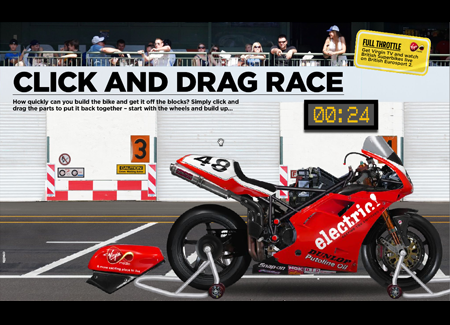 Click and Drag Race game for the virgin electric! eDition based ezine. The game tests the players knowledge of motorbike construction. Drag and drop the parts to build the motorbike against the clock! 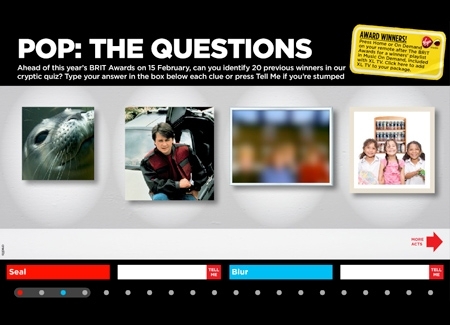 Cryptic Music Quiz game for the virgin electric! eDition based ezine. The game tests the users knowledge of popular music artists. If a question is answered correctly the text box changes colour. If the user is stuck they can press the "Tell me" button. At the end of the quiz the number of correct and revealed answers is totted up and the verdict given. A flash cookie stores the state of play for returning players. Darts game - Virgin electric! 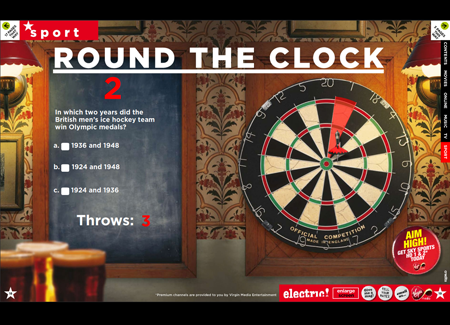 Darts quiz game for the virgin electric! Ceros based ezine. The game tests the users sports trivia knowlege. If a question is answered correctly the dart hits its target. If not the question is repeated later on until the user manages to answer all questions correctly and the bulls eye is scored. Conkers game - Virgin electric! 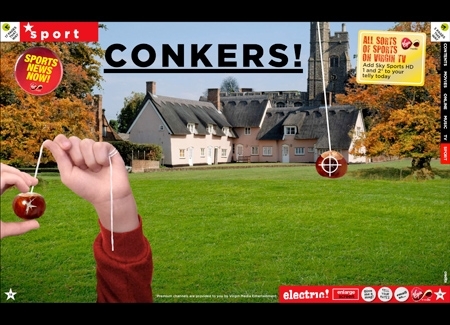 Conkers game for the virgin electric! Ceros based ezine. The game featured simple simulated physics of conkers on strings. The player takes it in turns striking and then avoiding the computer opponents conker. qualities of the Web with the engaging, familiar experience of a magazine. featuring - Animation, interactive content, data capture and games. 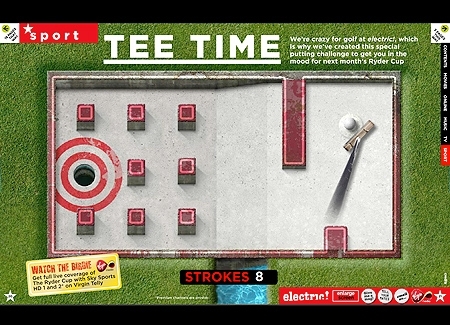 Put your ball around the three Crazy golf courses, watching out for the obstacles. The game features simple physics to simulate the reflective bounces and gradients. Rowing game - Virgin electric! 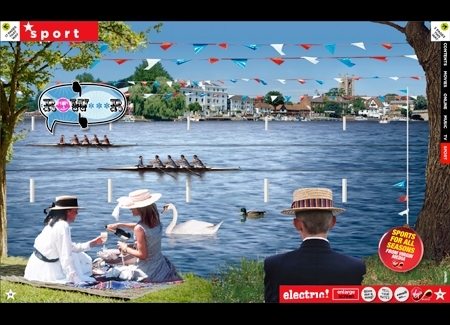 Rowing game for the virgin electric! Ceros based ezine. The game featured simple one key controls, the user had to press the space bar in the correct rhythm to ensure an effective stroke in order to beat the computer competitor!